The Yamaha C40 is arguably one of the world’s most popular and best loved guitars for beginners. In fact, nearly every guitarist that I meet usually has an old beaten up C40 that they either used to learn on or keep around for the occasional drunken jam session. So what exactly is it that makes the C40 such a great beginner guitar? 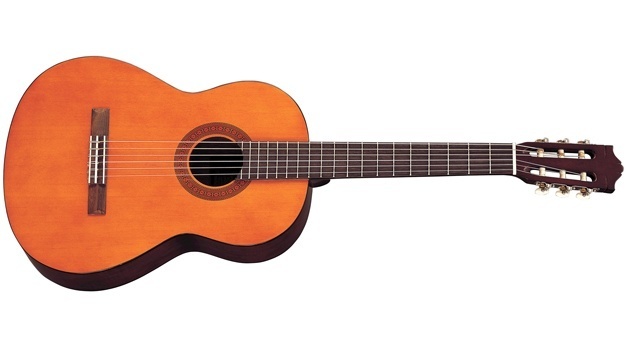 The C40 is a full-sized classical guitar, but is still significantly smaller in size than say a dreadnought acoustic. This makes it an excellent beginner for adults as well as children. However, like on all classical guitars the neck is fairly wide and does take some stretching to navigate across. The action of the nylon strings, on the other hand, feels extremely easy on the fingers and will make a beginner’s first few months with the guitar comparatively easier. Don’ let the C40’s low price point and humble looks fool you. As far as the guitar’s sonic capabilities go, you really couldn’t expect a better sounding instrument at the C40’s $150 price range. And to the untrained ear of the beginner, it can sound like a dream. The guitar’s tone is fairly warm and there’s a healthy amount of definition across the individual strings when finger-plucked. However, more seasoned guitarists will notice that the guitar’s tone can sound a bit muted at times, and that the instrument doesn’t really project that well no matter how hard you strum it. But like Yamaha states on its website, the C40 is a guitar made with beginners in mind so it’s not meant to have a professional quality sound output. Another reason that the C40 makes such a great beginner guitar is that it’s meant to last. I know a guitarist whose first guitar was a C40 that he’s dropped, bumped, scratched and even soaked hundreds of times, but is still in playing condition. Sure it might take a scratch or two when bumped particularly hard, but this instrument isn’t likely to fall apart in your hands anytime soon. By paying around 20 dollars extra, beginners can also buy the Yamaha C40 as a starter pack which comes complete with a padded gig bag, digital tuner as well as an instructional book and DVD. The bundle even includes a sturdy guitar stand so that you don’t have to leave your instrument lying around in random places. The most important thing to remember with the Yamaha C40 is that it’s a guitar meant for absolute beginners. If you’re an intermediate or advanced guitarist, you’re really better off investing a little more in a higher-end instrument. But if you’re simply curious about the guitar and would like to give learning the instrument a shot without having to dole out more than a week’s pay, the C40 is a great investment.